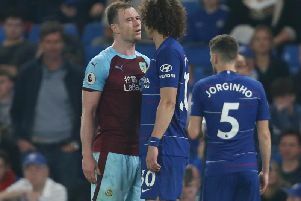 After scoring past a school friend and condemning his former club to the Premier League’s bottom three, Clarets winger George Boyd is hoping to inflict misery on weekend opponents QPR. The 29-year-old netted his second goal of the season when beating fellow former Howard School pupil Rob Elliot in a 1-1 draw against Newcastle United at Turf Moor - a result that dropped Hull City into the relegation zone. Though Senegal striker Papiss Cisse equalised in the second half of manager Sean Dyche’s 100th game in charge, Burnley’s four game unbeaten run helped the club climb to 17th in the table for 24 hours. “We did well first half and they probably got a rollicking at half time, they played some great stuff second half and I think a draw was a fair result,” said Boyd. “I used to go to school in Kent with Rob Elliot. He was in my school year, we used to play in the school team together and we’re from the same area so it was nice to put one over on him. The Scot, who scored his first of the term in the 3-1 defeat to West Ham on home soil in October, is now eyeing the fixture against QPR at Loftus Road as an ideal opportunity to stretch the purple patch. “It’s massive for us to get out of the bottom three,” he said. “It’s the first time this season, psychologically it’s massive and long may it continue. I’d rather it be them (Hull City) than us. He added: “We were confident anyway as a squad that we could do well at this level, and we’ve proven it, four unbeaten is good at this level and we’ve got another good game on Saturday to try and build on that. Meanwhile, striker Sam Vokes netted twice in a 70-minute run-out for the Clarets’ development squad in a 5-3 win at Sheffield United on Wednesday as he steps up his comeback from injury. Vokes was also on target last week as he played 45 minutes against Carlisle United, and he could again feature on Tuesday, when the development squad travel to Middlesbrough. Development squad top-scorer Jason Gilchrist also helped himself to a hat-trick in the victory over the Blades.